Providing value and reliable performance for both high-definition as well as 4K/UHD projects, MultiDyne® Video & Fiber-Optic Systems has expanded its line of high-quality fiber-optic transceivers with the introduction of the new SilverBack 4K5™ Fiber-Optic System for 4K quad-link 3G camcorders. At the 2015 NAB Show booth C7920, MultiDyne, will show U.S. broadcasters, for the first time, how its new SilverBack 4K5 camera-mounted system allows operators to broaden the use of their existing 4K cameras by converting any quad-link 4K camcorder to a 4K live fully systemized camera, connected to a base station with a single fiber cable. 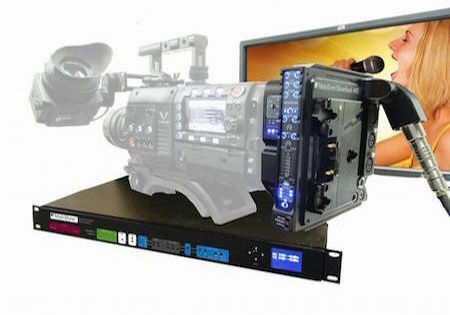 The new SilverBACK 4K5 incorporates the proven fiber-optic connectivity solutions of MultiDyne’s decades of experience outfitting production environments for OB vans and production control rooms to create a finely tuned solution for 4K/UHDTV multi-camera production that is easy to set up and free from distance limitations inherent with typical SMPTE video cables. The SilverBACK 4K5 provides a full-bandwidth fiber-optic link between any quad-link or dual-link 4K camera and the truck, control room, or “video village” position, enabling the user to incorporate existing cameras, HD or 4K, into a major multicamera project or allowing a director and director of photograph on set to have full connectivity to and from the camera positions. By putting power and five 3 Gb/s HD/SDI signal paths between the camera to the base station (required for multicamera 4K/UHD TV production) onto a single tactical or SMPTE hybrid fiber cable, the SilverBack 4K5 system ensures robust, trouble-free connectivity, regardless of the application. The SilverBack 4K5 base station is a standard 1RU enclosure with LED status indicators for each signal, as well as a color LCD screen that intuitively displays system status and general health. The ergonomics of the new SilverBACK 4K5 camera unit, among the most compact of its kind, mounts elegantly to any dual and quad link 3G HD-SDI 4K camera avoiding challenging angles or sharp corners. The respective camera manufacturer’s control panel provides full camera control throughout the system. Additionally, a 10/100 GigE path, genlock, intercom, and audio paths are also provided. To monitor operation, the unit’s display uses high-intensity blue LEDs that are easy for the operator to see, but not intrusive. The SilverBack family now includes five models: the new SilverBack 4K5™; the flagship SilverBack-II; the SilverBack-II-L for multicamera production; the SilverBack-II 4K-L, a feature-rich model that includes Ethernet support and a video option for viewfinder or monitor viewing in the field, enabling any 4K camera to be used as part of a multi-camera Ultra HD shoot; and the SilverBack II-4K, a low-cost model without the viewfinder/monitor viewing option, designed to support traditional film-style productions. Ultra HD support can be added to any existing SilverBack system through a simple upgrade, enabling customers to cost-effectively deliver a state-of-the-art 4K television experience.